During the month of January, as we keep our annual commemoration of the birth into life and eternal life of Venerable Mary Angeline Teresa, O.Carm., it seems opportune to spend a few minutes reflecting on the Venerable as a Consecrated Woman of the Church. The Carmelite Sisters for the Aged and Infirm have dedicated 2015, during the Church’s Year of Consecrated Life, to Mother Angeline, their Foundress, under this title. Mother Angeline was born on January 21, 1893 and died at the age of 91 on January 21, 1984. We are about to mark the 31st anniversary of her passing. 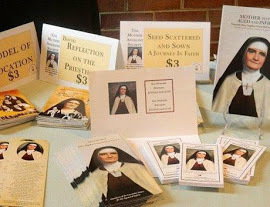 For the better part of her life, having entered the convent at 19 years of age, Venerable Mary Angeline Teresa McCrory was a devoted and fervent religious who lived the consecrated life with great zeal and intensity. Mother Angeline was a warm human being, motherly and sisterly at the same time. She was a dedicated Catholic and daughter of the Church, and lived her Christian witness as a Religious Sister for nearly 72 years. Her identity was one and unitary, her heart and soul set on following Our Lord with great trust. She lived her baptismal and religious consecrations brightly and intensely right up to the day that God called her back to Himself. The religious vows of Obedience, Poverty and Chastity that she professed, coupled with her added vow of hospitality as a Little Sister of the Poor, helped form Mother Angeline into a sensitive and caring person. As a Carmelite Sister, Mother Angeline added the spirituality of Carmel, the love of prayer and tender devotion to Our Lady, to an already open and generous heart. She formed and led generations of Carmelite Sisters in living their vocation of prayer, community and service to God’s elderly, effectively and profoundly. Among the first Prayer Intentions of our Holy Father, Pope Francis, for 2015, is the following one for January: “That in this year dedicated to consecrated life, religious men and women may rediscover the joy of following Christ and strive to serve the poor with zeal.” This worthwhile prayer which we are encouraged to offer every day of this month, could certainly resound in the heart of Venerable Mary Angeline Teresa. She lived her religious consecration with joy and zeal, and she served the poor elderly of every class of society with true charity. Throughout this year, we will reflect on Mother Angeline and her consecration. May this give us pause to think of our own baptismal consecration, and our consecration as husband, wife, priest, religious or single person, and ask to be filled with the Christian joy of knowing we are serving God and neighbor. Let us pray for the Carmelite Sisters for the Aged & Infirm, for their faithfulness to Mother Angeline’s charism and growth in holiness and vocations. And, let us never fail to try and know Mother Angeline better, and pray to her and for her Cause, for she will certainly help each of us to rediscover our Christian joy!